Montana / Glacier National Park Native American Ecotours! Embark on an authentic “Native Cultural Experience” with your knowledgeable Blackfeet Native certified guide while learning about the amazing history and geography of the Glacier National Park and Badger Two Medicine area near East Glacier! Options are available for affordable day-trips, or all-inclusive overnight adventures into the beautiful Badger Two Medicine area. Whether you choose to hike in or ride in by horseback, your adventure will include an unforgettable journey into an authentic Blackfeet Tipi village where you will learn about the areas rich historical past and unique culture. Your guides will pack in your gear and pack it back out so you are free to enjoy the adventure unencumbered. Alger Swingley, your official Blackfeet Native certified guide and state of Montana licensed outfitter, will share captivating information and interpretive stories along the way including fun facts and interesting details about the areas stunning geography, fascinating wildlife, and rich history! Tim Ryan, a tribal member of the Salish and Kootenai Tribes of Montana shares his expertise in ancestral skills, technologies, and traditional ecological knowledge of the tribes of Montana. Fascinating Native American stories and history. Artifact making using traditional native plants, stone, bone and hide. Day trips will include transportation to trail head, breakfast and lunch, guide services and packing services. Duration is approximately 10 hours. Departure is from East Glacier at 8:00 a.m.
• 8:00 a. m. Meet for trip details, breakfast and gear preparation. • 8:45 a. m. Depart East Glacier Outdoor center by tour bus to trailhead. 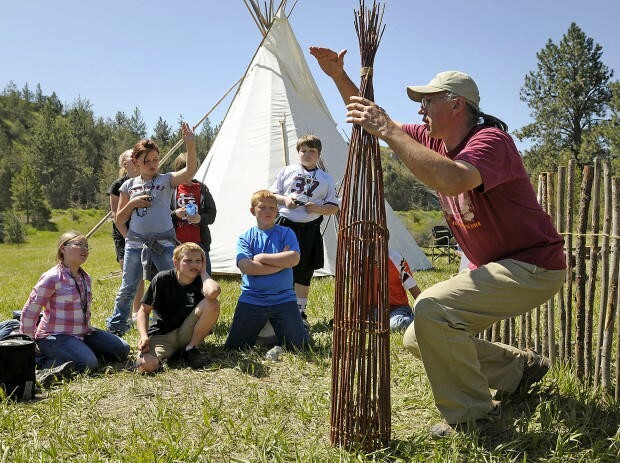 • Day schedule is flexible with cultural tours, native games, crafts, or optional guided fly fishing. • 4:00 p. m. Depart camp for return trip. • 6:30 p. m. Arrive back to East Glacier, End of the Trail! Overnight adventures include either a guided hike or horseback ride (your choice) for a 2-day, 1-night excursion into the Two Medicine River Valley and our specially prepared Blackfeet Tipi camp in the sacred Badger Two Medicine area. You will overnight in a traditional Blackfeet Tipi (camping gear, cots, sleeping bags with sanitary laundered bag liners, pillows and pillow cases are provided) with pit toilet facilities. Blackfeet Outfitters will take you through the best routes through the wilderness and the tipi camp is secure and protected, so you can rest easy knowing that your safety and enjoyment is of utmost importance. All meals will be included. Your guides will prepare for you fresh daily meals, hearty and nutritious, adhering to strict sanitary food handling procedures and requirements. They are also able to accommodate any dietary requests that you might have. Fly fishing and/or whitewater rafting can be worked into your day's itinerary if you would like.